The Pershing Square Signature Center, Signature Theatre Company’s new Frank Gehry-designed home on 42nd Street is one of New York’s most exciting additions to the cultural landscape. The theatres and lobbies are the picture-perfect settings for a wide array of events including corporate conferences and meetings, award shows, galas, upfront presentations, holiday parties, film shoots and more! Standing: 0 max., Seated: 294 max. A straight rake of seating rises from the stage edge and is contained within plywood walls that give the space a subtle architectural expression. The shaped plywood panels, which evoke the texture of cracked earth, wrap around the walls and will be painted to fade to black as they approach the stage, creating a transition from the architectural space of the room to the scenic space of the play. A single, grand doorway will connect this theatre to the lobby. The ceremonious closing of this door will indicate that the play is about to begin. Standing: 0 max., Seated: 250 max. The 191-seat flexible Linney Theatre offers our playwrights complete freedom to explore the relationship between audiences and performers. Standing: 0 max., Seated: 191 max. Grand opera house design and Off-Broadway intimacy elegantly combine in the 191-seat Alice Griffin Jewel Box Theatre. Standing: 0 max., Seated: 90 max. The Ford Foundation Studio Theatre is a state-of-the-art performance and rehearsal space where Signature artists will come to share their latest work or develop their upcoming production. Standing: 40 max., Seated: 80 max. The Rehearsal Studio is a state-of-the-art rehearsal space where Signature artists will come to share their latest work or develop their upcoming production. Standing: 300 max., Seated: 450 max. 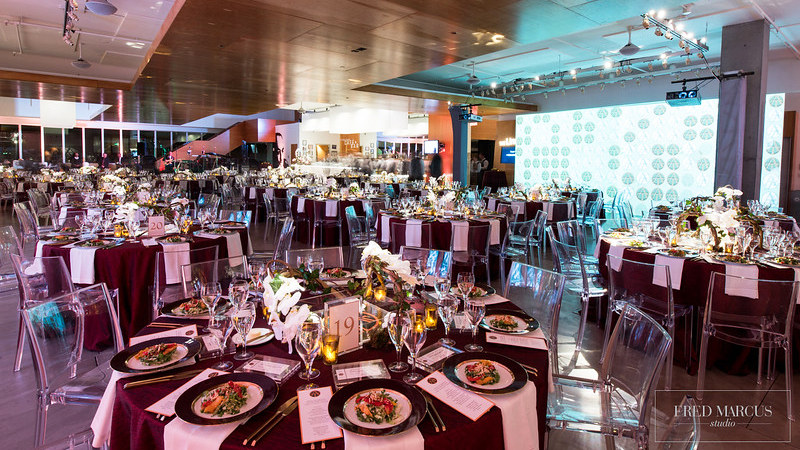 The 6,300 square-foot Center Lobby can be used for pre- and post-show receptions and dinners in conjunction with a theatrical presentation in one of our state-of-the-art theatres, or as a stunning venue on its own. Standing: 65 max., Seated: 130 max. The Griffin Lobby is the perfect space for corporate conferences and meetings, award shows, galas, upfront presentations, holiday parties, film shoots and more! It is also open during the day for enjoying coffee or a light bite at the café. Standing: 350 max., Seated: 400 max. Signature Café + Bar is the perfect spot to meet a friend for dinner or drinks before a show. Conveniently located in the lobby of The Pershing Square Signature Center, the Signature Café + Bar is the epicenter of activity --a place where playwrights and playgoers alike can mix and mingle over a cup of coffee or glass of wine. For those rushing to catch a show, pre-ordered meals are available as well. Our offerings change seasonally, see our latest menu.